Kathleen Ouimet Perrin, PhD, RN, CCRN, is professor emerita and adjunct professor of nursing at Saint Anselm College in Manchester, New Hampshire, where she has taught critical care nursing, professional nursing, ethics, health assessment and understanding suffering. While teaching at the college, she received the AAUP award for Excellence in Teaching. She received her bachelor’s degree from the University of Massachusetts, Amherst, her master’s degree from Boston College, and her PhD from Union Institute and University in Cincinnati, Ohio. She has been a practicing critical care nurse for more than 40 years, and has been a member of the American Association of Critical Care (AACN) Nurses for nearly as long. Kathleen has served on the board of the Southern New Hampshire AACN and is a past president of the chapter. She has been on numerous review panels for the national AACN. She was a member of the board of directors and President of the Epsilon Tau chapter of Sigma Theta Tau International. She has published and presented in the areas of critical care nursing, nursing ethics, nursing history, suffering experienced by patients and health care providers, and conflict among members of the health care team. She has written two other nursing texts: Nursing Concepts: Ethics and Conflict, and Palliative Care Nursing: Caring for Suffering Patients, which won an AJN Book of the Year Award in 2011. Carrie Edgerly MacLeod PhD, APRN-BC, currently works as a nurse practitioner in Cardiac Surgery Intensive Care in Massachusetts. She has also worked in critical care settings at major teaching institutions in New Hampshire and New York. She received her bachelor's degree from Saint Anselm College and both her master’s degree and PhD from the William F. Connell School of Nursing, Boston College. She has served as a faculty member at both at Saint Anselm and Boston College where she taught pharmacology, pathophysiology, and critical care nursing. She has published in the areas of patients’ and family caregivers’ experiences after cardiac surgery. Dr. MacLeod has lectured on management of the critically ill client at many symposiums across the United States. She has received both academic and clinical awards for her contributions to critical care nursing and client care. 1. 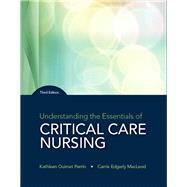 What is Critical Care?